I have caught a cold! Oh Joy! I just love being sick. I hope I don't pass it on to anyone else.Fortunately, the cold hit last night, so it didn't mess up our weekend. 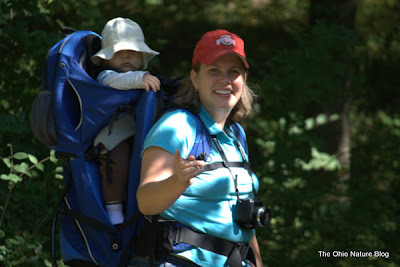 Megan, Weston and I continued our Metroparks challenge- which is to visit every one of the 15 Metroparks in the system here in Columbus and Central Ohio. Two down, thirteen to go! Sharon Woods a short drive from our home- just two exits off the beltway (i-270) that circles our great metropolitan area. Megan and I have been here before- pre Weston. We decided that the 1.8 mile Spring Creek loop trail looked perfect for a nice hike with our little guy. The trail offered a variety of habitats- upland old fields and forests, lowland headwater streams, and even a small created wetland. Although none of these habitats were stellar- I wasn't expecting to see an amazing array of biodiversity, the hike was still interesting and fun. As you can see over Megan's shoulder, the first portion of the hike led us through an old field dominated by Canada goldenrod. 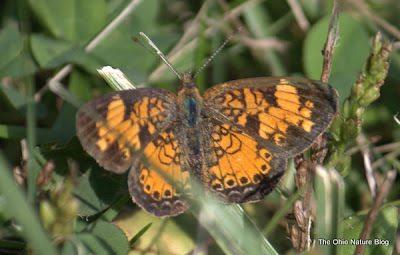 I kept an eye out for butterflies, but the only one I observed was this pearl crescent, one of the most frequently encountered butterflies in Ohio. After the old field, we entered a young woodland with several "wolf trees". 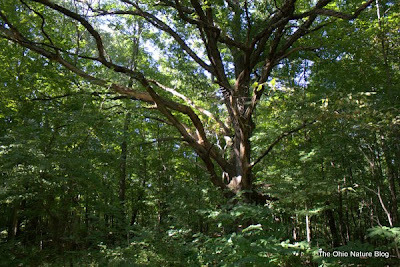 These trees, often much bigger than most of the forest, were remnants of a time when this land was probably pastured or farmed. The old trees would have been surrounded by crops or grasses. At sometime in the past, the land was abandoned, allowing tree seedlings to become established. Since they were all competing against each other, these trees grew quickly and very straight, in contrast to this large open grown oak. A little further down the trail brought yet another old field opening, this one much smaller. It supported a nice population of grease grass, Tridens flavus. This species seems to be relatively common in central and southern Ohio especially in old fields and infrequently mowed roadside habitats. 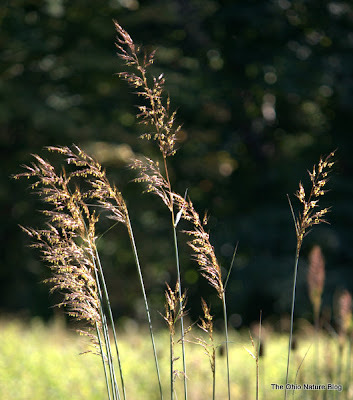 If you run your hands up and down the stem and panicle, you'll feel why this plant is given the name grease grass- it somehow produces an oily substance- if you haven't felt it, it's really neat. 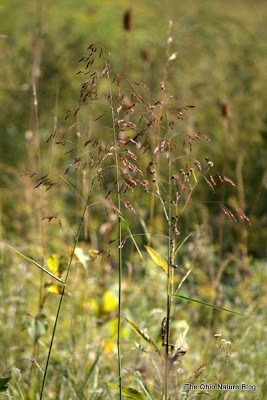 Another species growing in this meadow was Sorghastrum nutans, or Indiangrass. One of our showiest native grasses, I'm not exactly sure what it was doing here. It is native further west in Franklin County in the Darby prairies, but here it may have been planted or introduced from mowing equipment. It could have been a natural population, but I'm guessing that it is more likely introduced at Sharon Woods. With Megan carrying Weston, she kept continuing hiking on, especially after my grass photography. It was taking too long- and he is heavy. It's hard for me to not take a photograph of a honeylocust trunk covered with protective spines. I just find those spines amazing. 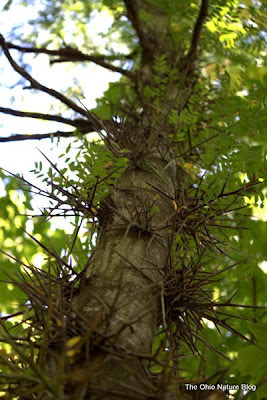 The honeylocust is considered an example of an anachronistic species, first described by Dan Janzen and Paul Martin in 1982. The gist of this theory is that this tree species' protective spines are no longer needed because the giant herbivores that this tree evolved with and developed these spines to protect against are now extinct. 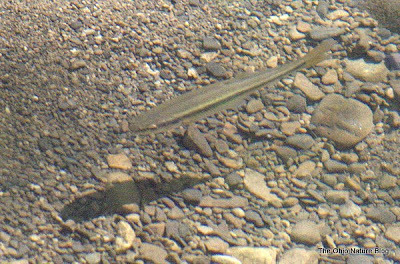 We crossed over a small stream that was full of minnows- although I've only dabbled in identification of Ohio's fish, if I had to guess- this is a creek chub. 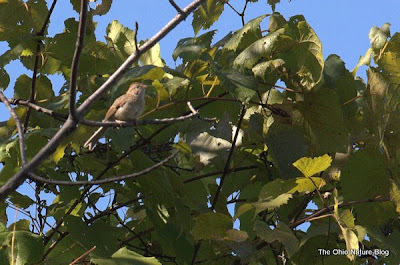 Out of the forest and back into the old field, I did spot a few birds, including this field sparrow. 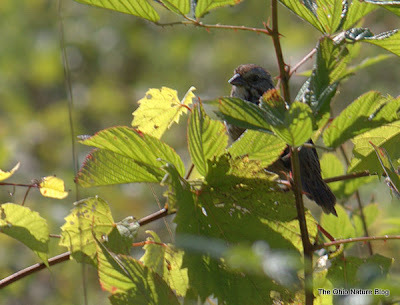 And, what I think is a song sparrow. After just short of two miles of hiking, we finished the loop, and stopped to take a break before we got into the car. 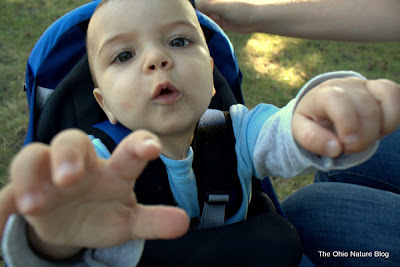 "Dad, that was fun hike, but I really just want to eat your camera!" If you'd like to visit Sharon Woods, here is a Google map with aerial photography that shows the lay of the land. I've placed a pin where we began the trail, and roughly the traced our path. Overall, a nice little place for a quick getaway from life in the city. 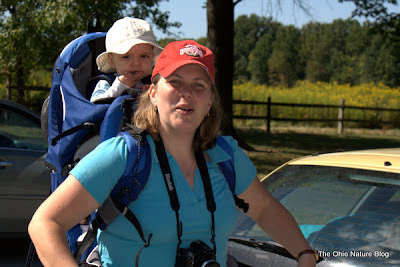 Also- Megan is also blogging about our Metroparks Challenge with pictures of me not seen here. So, two Metroparks down, thirteen to go. The next hike will be Batelle Darby Metropark, home to one of Ohio's highest quality stream ecosystems, the Big and Little Darby Creeks. I think this idea of hiking your local parks as a family is just great. You all 3 are obviously enjoying it very much and will be the healthiest family around. Great shots of what you saw. 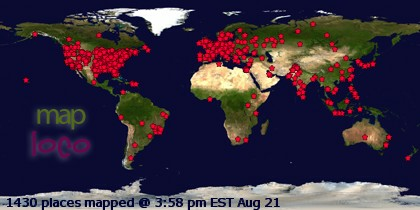 Just discovered your site. What a terrific way to record nature! Do you have butterflies or moths? I did see the pearl crescent. The gps maps are a great idea. 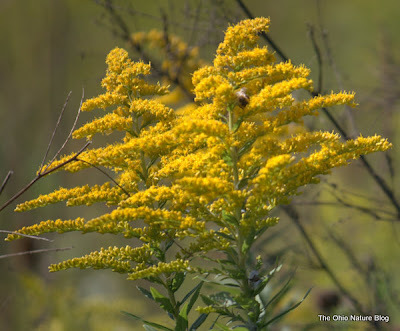 Are you interested in the Ohio Lepidopterists? Look them up on the internet. You might find a group of compatriots.